Ottawa Senators defenseman Erik Karlsson. The Flyers are red hot, and, with their potential playoff seeding looking better by the day, the 2018 NHL trade deadline could be an interesting one for general manager Ron Hextall. After a few years of quiet deadlines to start his tenure, a recent rash of goaltender injuries forced Hextall into making a deal, which he did by acquiring Petr Mrazek from the Red Wings for two conditional draft picks. And with the Flyers winning again on Saturday, beating the reeling Senators, 5-3, in Ottawa, Hextall might not be done making moves just yet. The victory over the Sens temporarily moved the Flyers (33-19-10, 76 points) into a tie with the Penguins for the top spot in the Metropolitan Division, so Hextall almost certainly won't be selling. If anything, he'll be trying to bolster his current roster as he prepares the team for a playoff run. Just a few short months ago, that's something almost no one was expecting. On December 3, coming off a 10-game losing streak, the Flyers were dead last in their division and tied for the fourth fewest points in the entire NHL. Now, not only have they gone from worst to first in the Metropolitan, but they also have the seventh most points in the league. With just 48 hours until the trade deadline, things might just get interesting. Or perhaps the recent surge from the Flyers – they've recorded at least a point in 20 of their last 25 games (18-5-2) – has Hextall feeling more confident that his team, the hottest in the NHL, can make a playoff run without adding any other big-name free agents. This time of year, NHL players can find themselves worrying about their futures with their current teams. That won't be the case for the Flyers, and after turning their season around and climbing their way into playoff position, that feels well-deserved. Things in Ottawa aren't going quite as well. Speculation that the Ottawa Senators are poised to move superstar defenseman Erik Karlsson before Monday’s trade deadline has reached a fever pitch, with other veterans who led the team to the Eastern Conference final last spring also likely playing their last game before an unpopular rebuild prompted by a disappointing record and lower than desired attendance numbers. The house cleaning started when the Senators dealt defenseman Dion Phaneuf to the Los Angeles Kings on Feb. 1, and continued Friday when they sent center Derick Brassard to the Pittsburgh Penguins. The Senators (21-29-10) are admittedly feeling the effects of what defensemen Mark Borowiecki called “trade purgatory” after Thursday’s 4-3 home loss to the Tampa Bay Lightning. 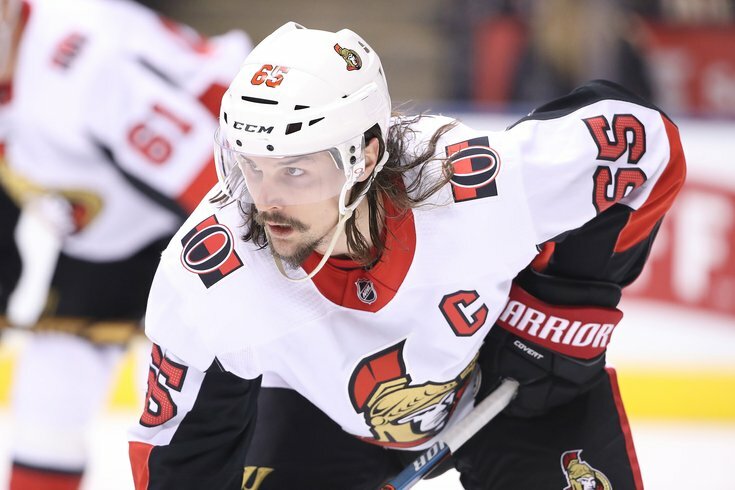 That speculation in Ottawa isn't going to get any better after their most recent loss to the Flyers, who are reportedly one of the teams interested in Sens defenseman Erik Karlsson. That's right, the Flyers are one of the teams rumored to be interested in Karlsson, at least according to TheFourthPeriod.com. They also have Karlsson listed as their top available free agent. Whoa, nelly. It's gotten to this point in Ottawa. Karlsson takes over the No.1 slot, but we caution a trade by the deadline seems unlikely - but not impossible. The Sens are taking calls, but the return will have to be huge. So what might a Karlsson trade look like? And would Hextall be willing to pay it just because his team is performing better than expected? If the Senators want to set up their franchise for the future, who better to trade with than the team with the deepest prospect pool. While the roster player may be of lesser quality, as I wouldn’t expect Hextall to trade any of their stars or rookies, they can offer a higher quality and quantity of prospects. Before the Flyers acquired Mrazek, it was reported there might be something in the works for one of the Sabres two goalies. That ultimately didn't happen, but the same reporter, TSN's Elliotte Friedman, recently mentioned the two teams have continued to scout one another. Maybe there's a chance they were talking about someone else, like forward Sam Reinhart? They have an in-depth breakdown of the convo between Friedman and Jeff Marek on the 31 Thoughts Podcast and more on Reinhart and what he might cost. Here's a brief summary, but go check out the whole thing. • The Flyers and Sabres have apparently been scouting each other and have at least been talking about a deal of some sort. It is at least possible that that deal could feature the Flyers dealing a young defenseman for Buffalo forward Sam Reinhart. • Reinhart’s a pretty solid young forward who has stagnated a bit in Buffalo this season but would be a welcome addition to any team. Buffalo has a lot of good young forwards that may be pushing Reinhart out of the team’s long-term core, and they have nothing at all in the way of good young defensemen. The Flyers have those, which is why a deal may be there to be made.